In less than 72 hours I will have the new Spring/Summer 2009 Stampin'Up catalog in my hands. I will be over in Orlando for Leadership for three days. The demonstrators attending will be given the brand new catty. Then next Saturday is the Regional and my downlines will join me for a day of fun. So I've had to get a few cards made for upcoming birthdays. My son's birthday is the 15th and since he turns 40 this year I have made two cards for the ocassion. This one shown is the "NICE" birthday card for the Big 40. There are so few stamp sets for a man. 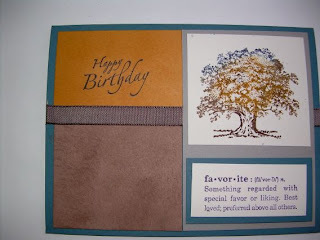 I again chose my all time favorite stamp set, Lovely As A Tree. I will cry the day that Stampin'Up retires this versatile set. Speaking of retiring, tomorrow the retired accessory list will be announced. From previous experience these items disappear very quickly. Many items are sold out in the first 24 hours. So be prepared to act quickly when you see the list. Remember the retired stamp sets are able to be purchased at 10% off.